Since I started creating jewellery a few years ago, I had the opportunity to participate at various handmade fairs, and the one thing I learned from them is that the way you present your product can be more important than the product itself. The same applies to your room and personal space, and even if you don't think constantly about it, you should invest more time in it. Your room is the place you sleep and maybe study or relax , so a beautiful and tidy environment will help keep you happy and positive. 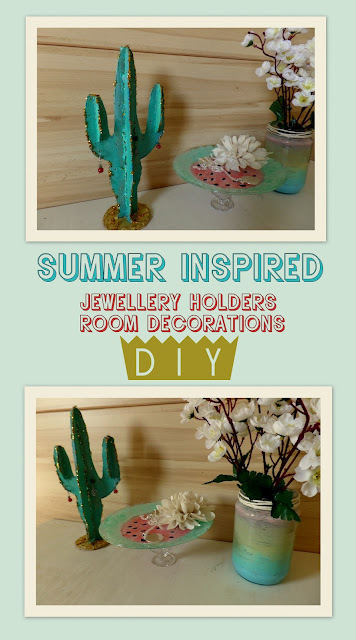 This DIY consists of 3 items : a cactus earring holder, a watermelon plate (jewellery holder ) and a decorative jar that can also have a specific purpose : a vase , a candle holder or simply a place to keep your makeup brushes. Also I tried to do this as cheap as possible, with dollar store products or things you can recycle. Draw a desert type cactus shape on a piece of paper and cut it out . Then cut 2 big pieces of cardboard from the box and trace the shape of the cactus on to them. Cut out the cactus shapes of cardboard. One of the pieces will be your base. As for the second-cut out from it the body and the arms of the cactus. Then cut all of them in half. Next you will use the glue gun to stick all of the halfs on the cactus base shape right in the middle of the body and in the middle of the arms. For this to stand you will need a support -so cut out a cardboard circle and stick the cactus on to it. If these steps seem a little confusing please watch the video from the end of the article. After all it's glued go ahead and paint it. I used a minty color for the cactus and a sand color for the support. Once it's completely dried add some glue on the edges and sprinkle some glitter on to it.You can also add glitter to the support. After that shake it good and leave it to dry. Place the plate with the back facing you. Start painting the edge of the plate with green ( I used a minty color) -to represent the peal of the watermelon. Then start painting the seeds with black in the center of the plate. After that's done start adding pink paint to represent the fruity part. 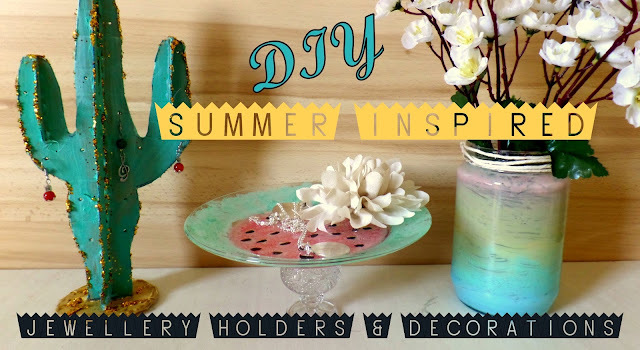 After completely dried go ahead and stick the cup to the back of the plate and you will have a beautiful watermelon jewelery holder. Start painting the jar from the inside in layers. I was inspired by a sunset at the beach so first I added light blue, then minty color, then sand color and at the end some pink. I blended them carefully without mixing them together. At the end I added some glue to the top edge of the jar and rolled some white string over it. This is optional. You can leave like that, add paint or even glitter.